A friend of mine recently explained to me the simple manner in which she organizes the desktop on her computer. She has a scant three main file folders, curiously titled: Food, Body, and Play. I didn’t inquire about what she puts in the latter two, but the first one, Food, isn’t for what I would have guessed (recipes, food writing, images, PDFs of take-out menus, etc.). The folder is an umbrella for everything that fuels her—creatively, spiritually, and all of the other intangible ways us humans can be fed. Isn’t this the best idea you have ever heard of? After she told me this, I checked out my desktop and counted. I have 19 file folders—randomly titled from the discouraging “unfinished” to the slightly more hopeful “friends”—and 16 loose documents, apparently un-categorizable, scattered in no particular pattern. Don’t you now want to completely reinvent your desktop and find your own three words? If so, what would they be? I’m still working on mine, though “Unfinished” is looking more and more like a final three possibility. I bring this up because I want to share with you what’s been feeding me this week—both literally and literarily. 1. NPR’s On Being with Krista Tippett. Specifically, the episode, “Words that Shimmer.” And even more specifically, this poem, which I dare you to read aloud to yourself right now. You know how sometimes food tastes better because you made it yourself? Well, I think this pudding tasted better because I didn’t make it. From start to finish, Matt made this one. All I had to do was eat it, gratefully and noisily—for some reason, I couldn’t eat a bite without making some weird, part-purring, part-snoring mmmm sound. Matt kept making fun of me. I laughed and then quickly resumed eat-growling. The pudding transcended spousal bickering—mmmm! It was so good. Speaking of spousal bickering, check out what Matt bought recently via an antique online auction. Her name is Harriet. She hails from 1864. And if you have recently dined with us, she has definitely watched your every move. Here's to being well fed! Preheat the oven to 325. Place six 4-ounce ramekins on a rimmed baking sheet and set aside. Melt the chocolate with 1/2 cup of the cream in the top of a double boiler over medium-low heat or in a metal bowl placed over (but not touching) simmering water, stirring occasionally. Remove the chocolate from the heat and stir until the mixture is smooth. Bring the remaining 1 1/2 cups of cream to a simmer in a small saucepan over low heat, stirring occasionally, and simmer until the cream is scalded (a light skin will have formed on top). Stir in the sugar and salt, remove from the heat and continue stirring until the sugar dissolves. Add the hot cream to the chocolate mixture and whisk until the mixture is smooth. Slowly whisk the egg yolks into the chocolate mixture, return the mixture to the double boiler, and cook it over low heat (the water should be simmering), stirring constantly for 3 to 4 minutes. Pour the pudding into the ramekins, dividing it evenly. Cover each ramekin with foil and bake the puddings for 15 to 18 minutes, until the edges are slightly firm but the centers are still soft and jiggle when you shake the pan. Uncover the puddings and place them on a rack to cool for at least 1 hour. 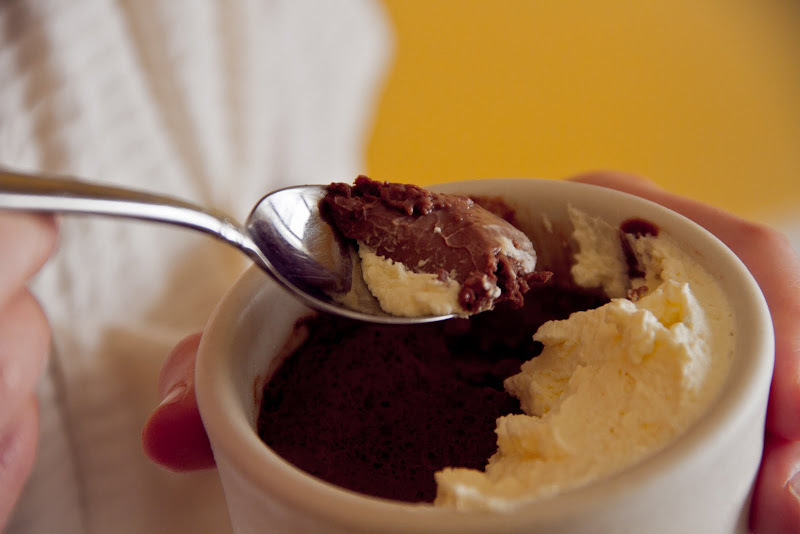 If serving warm, dollop the whipped cream on top of the pudding; otherwise, let the puddings cool completely, then cover and refrigerate them until ready to serve. Top with the whipped ream just before serving. Loved this pudding! I love this, esp. as a believer that one's desktop organization is directly related to ones life organization. My file folders would read: Food, Food, Food? There is much to be said for being presented with food by someone else who has prepared it. I don't know what Harriet's problem is -- who could stay so stone-faced with a delicious spoonful of pudding hovering so close?!? holy shiz that looks heavenly!!! yay for a young huuusband! that last photo = amazing. I'm planning on making this for a dinner party next week for eight friends. Would you recommend doubling the recipe or can I get by with the six servings? Thanks for posting! @anonymous - I've just asked the cook (aka Matt) and he says that while you COULD get away with using 8 ramekins and just filling them with less pudding, he would choose to double it. 3 folders is awesome. i wish i could narrow it down to 3 folders because i have too many. one is "inspiration" and inside that folder are many folders. then i have a "work" folder with many folders inside of it. then i have a "personal" folder which is useless and i never use it. i'll stop naming folders now because there are too many. I think I'll try to make my man make me some pudding. 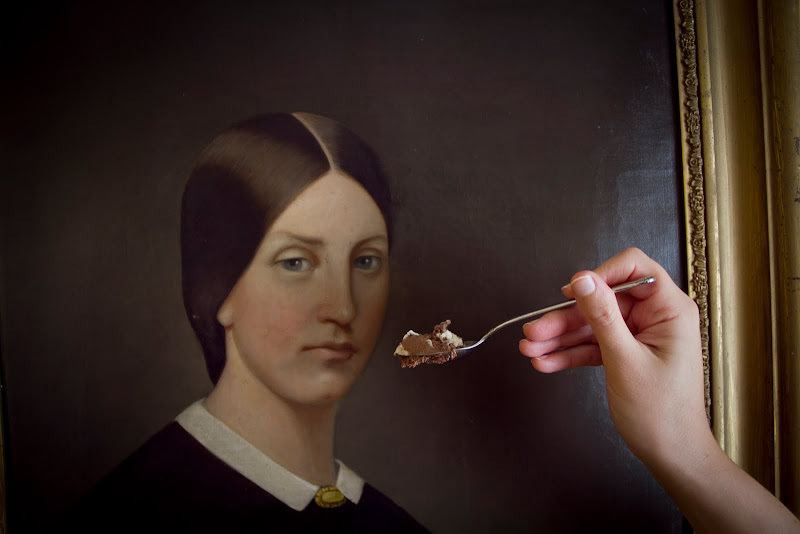 I haven't had chocolate pudding in years, but these pictures have pushed me over the edge. I have to make it , looks so goog ! What about sweet-sweet choco pudding. Great work. uuuhhhggg filing keeps me up at night! You are an enterteainer! Love it! And doesn´t matter if you are Matt were cocking, it's just yummy!!! My three desktop folders are entitled "Dissertation", "How to do Stats", and "A++". Ask me later what A++ contains. It's perrrsonalll! If that's not a glimpse into my headspace right now, I don't know what is! Great job on the pudding, and by the way, THE PHOTOS ARE GORGEOUS!! Your photographs are so beautiful. If Harriet doesn't want her pudding send it this way. Wow. The whipped cream on that photo looks so fresh and fatty. Lookin' good. What a pleasure to see Harriet! That minx. I ♡ Harriet! and you. is it just me or does Harriet have a slight resemblance to Matt? I don't mean that insultingly but...she could sort of be Matt's spinster great great great aunt no? Oh, that bittersweet pudding would so fuel me. When I was a culinary school student (I wrote about it here, if you're interested: "Culinary School: Three Semesters of Life, Learning, and Loss of Blood," on Amazon Kindle - http://amzn.to/oqXw1R) we never made such simple dishes, but, really, this is the food of life, isn't it. What a delight! Can't wait to handover this recipe to my sister! I'm going to enjoy this one! LOVE that painting! Matt is hired for all my decorating needs. As for the pudding, I am in heaven now that you have posted it. I can rest at night, knowing its secrets. Can I get a picture of how Harriet and the Vivianne look together?